Once I get my Xcontroller up and going with the probe and switches and such, my plan is to switch to UGS to be able to use the Triquetra. You can use the Triquetra now and still use Easel. All you have to do is Zero you bit using UGS or PicSender and then exit that program and load Easel. When Easel asks you to confirm your bit position then you tell it your bit is at 0 0 0. Of course if you are asked to Home you tell it "Oh, Hell No!!". Then continue on with Easel the way you normally would. Yea, I know. And it's more of the connections to the Gshield itself as opposed to the different pieces of software. It's incredibly complicated (like most things I do...not sure if that is good or bad) and hopefully resolved soon. I'm also planning to do it manually this weekend with a DMM to set the position...modifying the process to work around the current scenario. Go to my website at www.triquetra-cnc.com and use coupon code 3corners. You'll get to keep a $20.00 bill. Probing to get zero on all axis is essential as gas is for driving a gasoline car! When you use the homing switches the XY can be set there but when you use the Z home puts it up to the top. So you have to manually move it back down. I cannot always get it at position on top of the material exactly each time. Also if you clamp material away from home then you need all axis zeroed or you get cuts that have errors if you have more than one tool passes. Would be nice to view them especially if I home it then set all axis to zero then when its moved I can tell where I am at all times. The coordinates should be displayed at all times. I do not understand why UGS and others do not do this. Professional system have this as a standard feature. 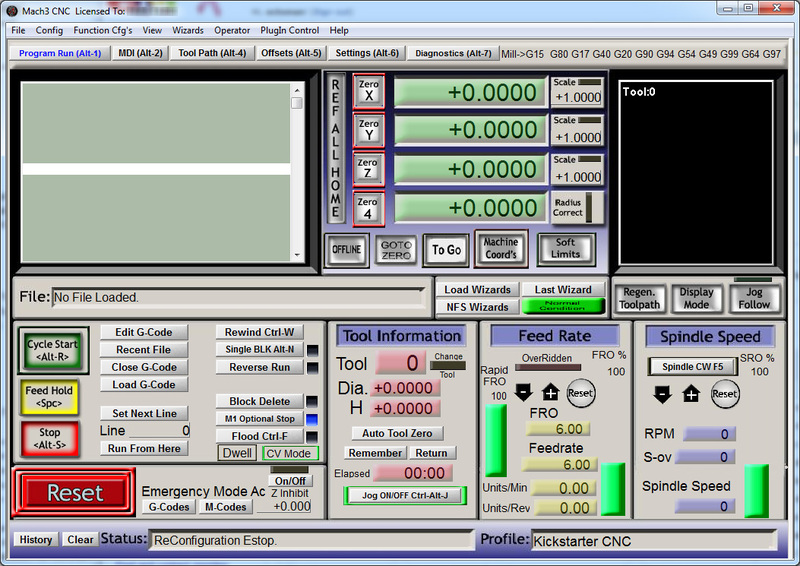 Just look at Mach3 their interface. So I got to using the Xcontroller with everything connected and this appears to not work. Every time I switched between UGCS and Easel, GRBL was alarm locking and requiring a homing cycle to run every time. Even if I cleared the lock, it didn't maintain position between switching programs. I eventually went 100% UGCS and everything was fine. On another note, for those with new Xcarves or the upgrade kit, the cabling that comes with the Inventables Z probe works with this block. The wire is is tight but it does work. I've bought some plugs to adapt the wire that came with the block into the Z probe socket but I have not tested those yet. A 10 pack from Amazon was only like $5 so I figured I'd try it out. Are the plates still available? I would like to purchase one. Your videos are great and now I need one haha! I just wanted to say Thanks to Charly for his work on the plate and software. I decided to try cutting my first aluminum plate yesterday and figured that it would be a good time to setup and start using the touch plate as well. Spent about 30 minutes getting it plugged in and fine tuned, instructions were very easy to follow and I used PicSender for zeroing. The aluminum cut has a bit swap after the initial cut to go from a .25 to a .125 bit for some drilling, I used the plate to zero the first bit then again to zero the second and it was just made easy!!!! Glad to hear it. I love a success story!! Hello! Do I need to have the limit switch to use this? Because I'm mostly use the center part of the X-Carve (1000x1000) 99% of the time and I have removed the limit switches. I don not use limit switches on my 1000mm X-Carve. Got tired of breaking them when testing to see if they work. Had more important things to do like setting my work position to 0,0,0 and makin' stuff!! I've tried to make a plate like this my self, but my X-Carve is not precise enough. I must tune and adjust it more to make things like that. I did receive your order. Watch your email for a Shipping Confirmation and a Tracking Number. You ordered just in time for me to get it out to you today!! I completely understand your frustration in trying to mill one out. It took me a good while before I perfected the tool path, federate, depth of cut and stepover to be successful with it. Now that I have it down, it is pretty much start the carving and go do something else for a while. What are the inch/mm dimentions of the plate? How high is the Z part over the material? How deep is the inset underneath. This will be the minimum thickness for the material to be carved. Am I right? I guess it also can be used upside down on thinner materials. Aligning the sides and the open inset corner of the plate to the material corner and sides. What are the inch/mm dimentions of the plate?How high is the Z part over the material?How deep is the inset underneath. This will be the minimum thickness for the material to be carved. Am I right? The touch plates are approximately 2 1/2 inches square overall. The milled out area is approximately 2 inches square which leave 1/2 inch un-milled on the bottom side. The total height is approximately 1 inch with the milled out area being just under .8 inches. You can use it on material that is .20 inches thick or greater and yes you can flip it upside down and use it to zero the z axis anywhere on the material. I have made custom sizes in the past on request for those milling out PCB's or other very thin material. Do you still have these available? If so, could you please message me the link to buy.